Originating around 1891 Germany, The German Shepherd is an old breed, spanning over a century! These well known dogs were originally bred to assist in herding livestock and to offer the herd protection from predators. We will talk about dog food for German Shepherd below. These highly intelligent dogs became famous for their countless wartime applications not just for Germany but along both sides during WWII. The German Shepherd Dog’s popularity only rose with characters like ‘Rin Tin Tin’, finally settling as the third most popular American dog in 1993! 4. How Many Calories Does a Dog Need? Though they may look vastly different, all dog breeds are still dogs and have the same basic nutritional requirements. They all need the same types of vitamins and minerals, and all require protein to thrive. Though one breed may eat more than another, this basic rule always stands. For example, the foods for GSD are also going to be great foods to give Labradors or Boxers. Knowing what foods are better than others is first about knowing what to avoid, since almost all dog food manufacturers use the same type of ‘lingo’. Though all dogs were originally more carnivores than anything else, they have slowely adapted to a human omnivorous (both plant + meat eating) diet. Animal meat should still build the majority of a dog’s diet, not plant products. How Many Calories Does a Dog Need Each Day? There is no ‘cut and dry’ exact amount for every single dog breed, because there are hundreds of breeds today- all different sizes with different energy levels. On average, adult dogs need about 30 calories per pound of body weight each day. An 80 pound adult German Shepherd might eat about 2,400 calories every day! It’s important to feed your puppy ‘puppy food’, specially formulated for puppies, and adult dog ‘adult food’. Read the recommendations on the back of your dog food packages, and follow their recommended serving sizes. The AAFCO recommended large breed dog foods (like your German Shepherd) contain between 30-40% high quality Animal based protein, with an absolute minimum at 22%. Try to avoid foods, like the two listed below in brown (Food #1 and #2), that contain mostly plant proteins. Between 15% and 30% high quality animal fats is also recommended. Fats help your pup develop strong, healthy joints and bones, cushion internal organs, and enhance their food flavoring! Carbohydrates are debated among dog experts worldwide! Carbs weren’t a large part of ancient wolve’s diets, and today’s dogs don’t need much at all. A dog’s physiology (internal body makeup) isn’t much different than a humans, with this exception: dogs don’t use carbohydrates for energy like humans do. In the end, 5%-8% carbohydrates are recommended. Low quality foods will often use high carb sources, like corn and wheat, as ‘filler’ ingredients to make their foods seem like more than what they actually are. Watch out for these ingredients! Very few people actually know what goes into the creation of dog food for German Shepherd. Large manufacturers, though legally obligated to include these ingredients in their nutritional labels, count on consumers not understanding the exact meaning of those labels. Because, simply said, those foods would be Far less popular if everyone truly understood them. Dog Food Rendering: Animal scraps, and in some cases entire carcass, are collected, ground in large industrial vats, and heated at high temperatures until all moisture and fat is removed. Meals are products of dog food rendering. By-products: These are clean, non-rendered ‘parts’, other than meat, coming from slaughtered animals. This could include the lungs, kidney, spleen, brain, blood, bone, fatty tissues, stomach and intestines. By-products are another cheap way companies can cut the costs of dog food for German Shepherd. Meat Meal: All animal tissues (excluding the by-products listed above) are rendered (cooked) at high temperatures. The after solids are added to pet foods as ‘meal’. Not all meals are bad; some are high valued protein concentrates. Generic ‘meat meals’, on the other hand, should be avoided, since you have no idea what type of meat they are. Meat by-product Meal: Meat by products that are added to foods after the rendering process. Meat by-products, like chicken by-product, is not actually meat at all. Corn and Corn Substitutes: Corn isn’t necessarily good or bad for dogs. Large manufacturers use it (especially when among the top three ingredients) not for the nutritional quality, but because it is cheap and easily grown. By using corn products, they can produce a very inexpensive product and maximize their profits. Watch for these ingredients in the examples listed below! Many dog food manufacturers might say they are offering enough protein, but not all protein is the same. All proteins are made of of different mixtures of Amino Acids; no one protein is the same as another. Dogs need a certain number of Essential Amino Acids in order to thrive. They are able to find the best mixture of amino acids from animal protein, not plant protein. Some of the foods listed below might provide a lot of protein, but that doesn’t mean it is the right kind. The best way to find out is to examine the list of ingredients! The higher on a list of dog food ingredients something is, the more of it is used in the food. The two foods listed below are so extremely popular they are used by tens of thousands of pet owners across the globe. Very few dog owners haven’t at least heard of these brands, if not used them themselves. Despite their countless advertisements and promotions, these brands also produce some of the lowest quality, cheapest foods on the market today. According to the American Kennel Club, 25% of dogs have resorted to eating their own feces. The largest reason dogs do this is because of poor nutrition and a low quality diet. Choosing the best food for German Shepherd, or any breed, is just as much about knowing what to avoid as what to include. Look at the similarities between many of the ingredients below, and the definitions above. U.S. pet food sales in 2017 reached almost 30 billion dollars! As of 2017, Pedigree, Purina and Iams produced 5 out of the 7 top selling dog food brands. These are all generally low quality, cheaply manufactured one star dog foods, just like those listed directly below. Perhaps the number one most popular dog food of the three listed below, this is also one of the cheapest. Corn, an almost useless filler ingredient, is used among two of the top three ingredients. The only meat product, if it can be considered much of a meat product, is a mixture of ‘mystery meat and bones’ grinded and rendered. Meat and bone meal is considered by some as more difficult to digest than other meals. Anonymous ‘meat meals’ can come from almost any source, and should be avoided. Chicken by-product isn’t meat at all, but other clean, non-rendered ‘parts’ coming from the chicken. What brand produces this outrageously popular dog food? You are looking at Purina Dog Chow. Again, you can see corn used among two of the top three ingredients. Instead of mystery meat, we are now offered mystery beef and bone meal. Soybean meal is a byproduct of soybean oil, and more commonly found in farm animal feeds. Beef tallow is a fatty by-product of beef rendering (remember, meat by-products aren’t actually meat). Like beef meal above, pork & bone meal is a dry, rendered product of pork tissues. Alpo is another outrageously popular dog food, often purchased for the inexpensive quality. Who hasn’t heard of Alpo? Now that you know what to watch out for, let’s take a look at some of the best dog food brands on the market today. Though they aren’t nearly as popular, very few manufacturers are able to boast the quality you’ll see below. If you want to feed your pup the very best there is out there, you’ll have a difficult time finding better options! *All of these foods are given 4-5 stars by Dog Food Advisor! 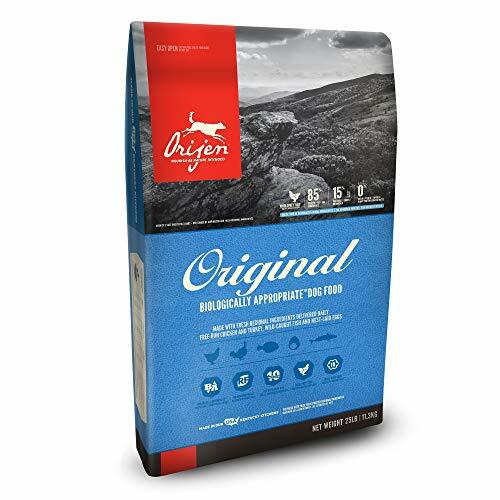 Orijen is probably the very best manufactured dog food brand on the market today! With only the highest quality ingredients, you won’t find any by-products or meat meals here. The top two ingredients offer high quality animal protein, whereas the third offers a high quality source of fish. Eggs are another good source of nutrients, often recommended for their healthy effect on a dog’s skin and coat. Fish in general are often rich in both Omega 3 and Omega 6 fatty acids. In the end, no dog owner, no matter the breed, can go wrong with Orijen. Top three ingredients consist of meat. Third and fifth ingredients are high in Omega-3 fatty acids. Eggs are considered great for a healthy coat and skin. 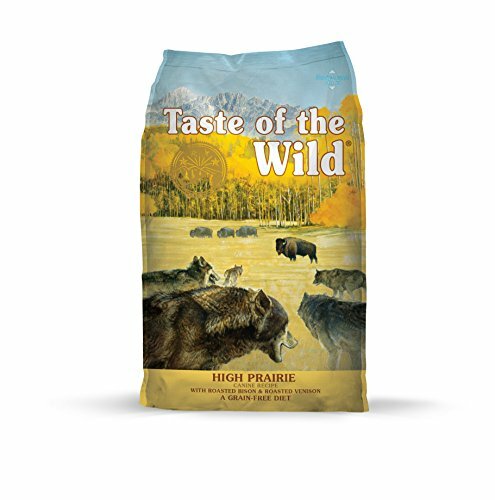 With Beef, lamb meal and wild boar, any dog will get the protein he needs here. A high quality source of animal meat listed as the number one ingredient means that the majority of the food is made from beef. Peas and garbanzo beans offer quality sources of carbohydrates, nutritious members of the fiber rich Legumes family of vegetables. Lamb meal is considered a meat concentrate, containing nearly 300% more protein than fresh lamb. Eggs are easy to digest and have an exceptionally high biological value. Egg product is fantastic for a healthy coat and skin. Peas are a quality source of carbohydrates. Lamb meal is a concentrated source of carbohydrates, much higher than regular lamb. 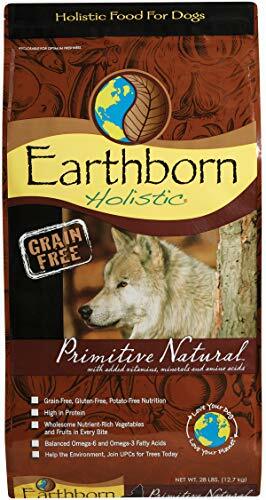 Earthborn Holistic takes a more ‘holistic’ approach to dog food for German Shepherd, with several high quality ingredients and very few fillers. Both chicken meal and whitefish meal are considered meat concentrates, chicken meal containing about 300% more protein than fresh chicken. Both oatmeal and barley are sources of carbohydrates, oatmeal rich in B- vitamins. Chicken fat is high in linoleic acid, an omega-6 fatty acid and essential for life. Although it may not sound appetizing, chicken fat is actually considered a quality ingredient. Both chicken and whitefish meal are protein concentrates, with up to 300% more protein than the regular products. Not only is Salmon high in Omega 3 fatty acids, it is a great source of meat. Chicken meal is much more concentrated than regular chicken, containing about 300% more protein. After removing the starchy portion of peas, they still contain about 80% protein. On top of that, tapioca starch and pea starch are fantastic forms of carbohydrates! Salmon is a great source of Omega 3 fatty acids. Chicken meal is considered a protein concentrate, with a much higher protein value. 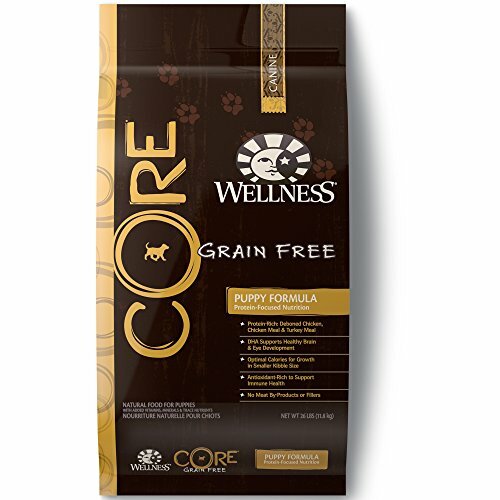 Yet another fantastic, high quality source of animal protein, Wellness CORE offers not two but all three of the top ingredients from animal sources! Both chicken and turkey meals are concentrated with a much higher protein percentage than regular chicken and turkey. Both potatoes and peas are quality sources of carbohydrates, rich in fiber! Top 3 are animal meat sources. Chicken and turkey meal are concentrated protein sources. Potatoes and peas are valuable sources of carbohydrates. Notice that not one of these high quality foods contain any form of corn, generic ‘meat meals’, or meat by-products among their top ingredients. Because they are able to get vital nutrients from their mother’s milk, puppies shouldn’t be separated from their mother and litter prior to 4 weeks. After that point, these little ones can begin to slowly transition to ‘wet’ puppy food, supporting their sensitive stomachs. Begin feeding 3-4 times per day over the course of 2 weeks. At that point, they can begin safely eating wet food only. At 8 weeks of age, the transition to dry kibble can begin. Because dogs tend to develop digestive issues if immediately switching foods, you should use the same, slow transition process. Once your junior reaches six months of age, the transition to dry food only can be complete! Your veterinarian will often recommend limited ingredient dog foods for skin allergies, to help narrow or eliminate the allergen. Not only will the food below help here, it offers high value animal protein! 1. How much food should I feed my German Shepherd Puppy? In general, puppies eat the same types of foods adults do. It is important to remember to feed your puppy ‘puppy food’ as opposed to adult food, because it both comes in smaller portions and often contains more concentrated sources of protein for a puppy’s developing body. The back of your puppy food container will offer recommended serving sizes for you to follow. Of course, a cheap food brand will still offer cheap puppy food. If it is ever important, nutrition is now during puppyhood when your little one is growing, both mentally and physically. 2. What do German Shepherds eat? All dogs are descended from Grey Wolves. 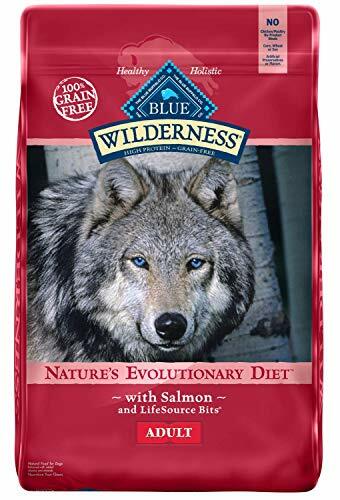 A wolf’s natural diet consisted almost entirely of animal meat and animal protein (animals in general), with almost no plant products at all. If a German Shepherd were to grow up in a wild environment among other wild dogs, they would (theoretically) form individual ‘packs’, and hunt prey animals for food. These ‘mostly carnivorous’ dogs would without a doubt prefer to eat meat. If they couldn’t find enough meat, they would resort to a plant based diet (or in-between). But German Shepherds are domesticated dogs. In the end, they will eat whatever we humans decide to feed them. That being said, the foods listed above are great options! 3. Can I feed my dog 100% meat and nothing else? Though wild dogs once lived of a diet nearly entirely made of animals, this isn’t a good idea anymore. Domestic dogs have grown alongside humans for centuries, slowly adapting to our omnivorous lifestyle. Vegetables contain many nutrients that are good for dogs, and should be included in their diets. Manufactured foods, like those above, account for several factors of canine nutrition, offering exactly the right combinations for your dog to flourish! 4. What is the best commercial dog food for German Shepherd out there? There are many great dog foods; sometimes it depends upon preference. Ingredient for ingredient, Orijen probably offers the highest quality ingredients out of any other manufactured dog food for German Shepherd. 5. Should I feed my German Shepherd raw meat? Where wild animals once flourished on a diet of raw, uncooked animal meat, hundreds of years have since passed. Most domestic pets don’t inherit the necessary bacterial or viral resistances from their mothers to easily cope with things like Giardia (found in untreated water), Salmonella, or other parasites that can be found in raw meat. Even though many dog owners believe in feeding their pets raw, uncooked meat, there is a danger. From an educated opinion, the risk isn’t worth it. 6. Why does my dog eat his droppings? According to the American Kennel Club, 25% (1 in 4) of dogs have eaten their own feces at least once in their lives. There are several reasons why they might do this, but the most common reason by far is inadequate nutrition. Most dogs (that have) resort to eating their own feces in order to acquire nutrients they can’t otherwise find in their diets. If you’ve seen your dog eat his droppings, it’s probably time to take a good, long look at the food you’ve decided to use. 7. What should I feed newborn puppies? Newborn puppies (younger than 4-6 weeks) shouldn’t be separated from their litters and mother. Not only do they gain important nutrients from their mother’s milk, vital for growth and development, young puppies develop important social skills that only litter-mates can provide.